Books > Language and Literature > Samboli! Beware! Lakshman (1957-2017) was from Kathriguppe, a village in South Bengaluru Taluk. 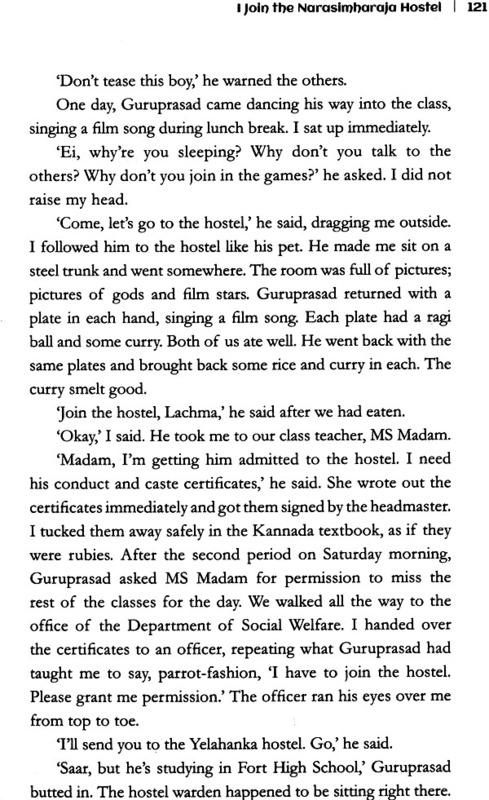 His parents Muthappa and Venkatamma were daily-wage labourers. He studied in the Government Primary School in Kathruguppe and the Government Boys Middle School in Basavanagudi and completed his studies at the Government Fort High School, Chamarajapet, He was a second division clerk at HKED Veerendra Patil Pre-Univercity College since 1980. As a social activist, he served as general secretary, Karnataka Dalit Sangarsha Samiti, Founder member and national vice president of Karnataka Vimochana Ranga and Founder president of Jaathi Vinaashaka Vedhike. As a writer, he has many collections of poems, short stories and two novels to his credit. The novels Jadimale and Badhuku have been transated into Tamil. Some of the awards he has recived are; Rashtrakavi Kuvempu Award (2003), Dr Ambedkar Fellowship National Award (2006) and Karnataka Keerthi Kalasa State Award (2007). Susheela Punitha has translated from Kannada to English, excerpts on theatre in Karnataka for Regional Theatre Histories, Institute of Economic Growth, University of Delhi Enclave, Delhi, and the following works of fiction for Oxford University Press: Hundreds of streets to the place of Light and other stories, a collections of short stories by S Diwakar (2015), Deepa, a novella by Na. D’Souza (2013), Asprushyaru, a novel by U R Ananthamurthy (2010). 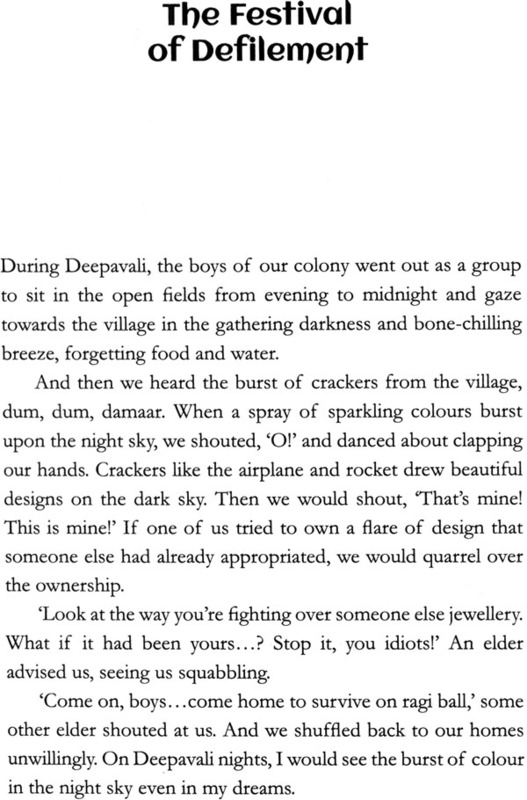 Bharathipura was shortlisted for the jaipur Literary Prize, 2012 and The Hindu Literary Prize, 2012. Hundreds of streets to the place of Lights was shortlisted for the Crossword Book Award, 2016. Susheela Punitha received the Sahitra Akademi Translation Award for English, 2015, for her translation of U R Ananthamurthy’s novel Bharathipura. Even Since I can remember, I have been asking, ‘Why? Why?’ At school, my teacher in the third class was a Brahmin with a vertical naama caste-mark on his forehead, black cap and coat and a kacche-panche, that normal way of wearing the punche, drawing the edge between the legs and tucking it in at the back at the waist. He made the Vokkaliga children sit in the front rows and us, Madigas in the back roes a little beyond them. He had two canes, one was the regular size, measuring from the elbow to the tip of his middle finger, but the other was as long as a baaru, measuring from the tip of the middle finger of one hand to the tip of the middle finger of the other with both arms outstretched. He used the short one to punish the Vokkaligas and the long one to beat us, flicking it with his arm outstretched, stinging us wherever it landed, whipping off a bit of flesh. Why this difference in punishment that left us scarred with stripes? He once beat me without warning. I winced. After class, he told me that he had seen me touch his bicycle. What was wrong with that? At home, the member of the master’s family cared for our well-being, and yet, why did they and even their children address my parents and grandparents disrespectfully? Why did they serve us on castor leaves in the cowshed with its perpetual stench of dung and urine? It was not just them. During Sri Rama Navami celebrations, panaka was served to passers-by in leaf cups to quench their thirst. But when we went for drink, we had to hold our cupped hands to our mouths and it would be poured from such a height that most of it squirted out wetting our clothes. One’s tongue would get perhaps a drop or two to taste the delicious sweetness of jiggery in lime juice. I realized only much later that the difference in treatment had nothing to do with whether people were good to us or not. It had nothing to do with whether people were good to us or not. It had to do with the age-old caste system that cheated our people of their basic right to human dignity. Our people had mouths, true, but no voice to voice their plight because they had no education. I barely completed my high school. I have been writing poems and stories since 1989. I began my athma-kathana when I was forty and took fifteen years to finish it. Samboil! traces my growth from my awareness that I was not seen as a person but as a Madiga to my awareness that as a Madiga, I am a man with a mission. I had barely sprouted a moustache when my friend V Basavaraju called me to be an activist. I participated in a torchlight protest rally organized by the Dalit Sangarsha Samiti in 1979 in Binnypete, Bengaluru, protesting the death of a Holeya at the hands of a Gowda because he did not remove the carcass of a cow from the village. Now I could see myself as a part of a larger persona, the samiti; I had found a community identity. Samboli! 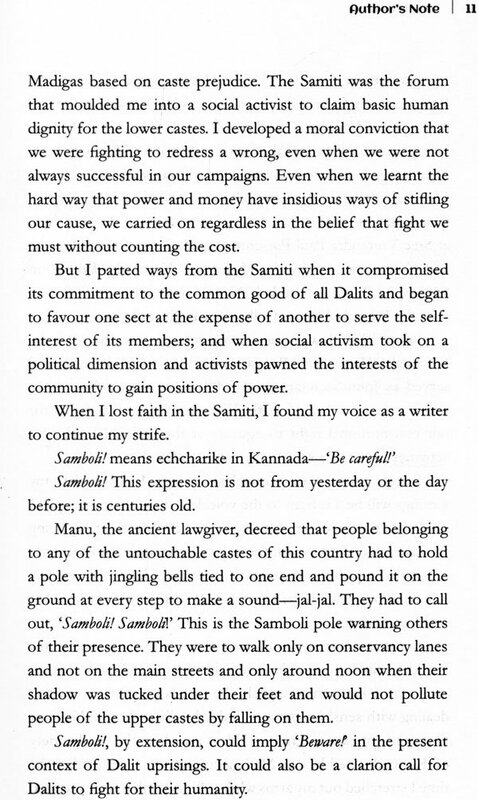 Is the life story of the movement as well.Here, I found my voice as a member of an association meted out to the Holeyas and Madigas based on caste prejudice. The Samiti was the forum that moulded me into a social activist to claim basic human dignity for the lower castes. I developed a moral conviction that we were fighting to redress a wrong, even when we were not always successful in our campaigns. Even when we learnt the hard way that power and money have insidious ways of stifling our cause, we carried on regardless in the belief that fight we must without counting the cost. But I parted ways from the Samiti when it compromised its commitment to the common good of all Dalits and began of favour one sect at the expence of another to serve the self-interest of its members; and when social activism took on a political dimension and activists pawned the interests of the community to gain positions of power. When I lost faith in the Samity, I found my voice as a writer to continue my strife. Samboli! This Expression is not from yesterday for the day before; it is centuries old. Manu, the ancient lawgiver, decreed that people belonging to any of the untouchable caste of this country had to hold a pole with jingling bells tied to one end and pound it on the ground at every step to make a sound—jal-jal. They had to call out, ‘Samboli! Samboli!’ This is the Samboli pole warning other of their presence. They were to talk only on conservancy lanes and not the main streets and only around noon when their shadow was tucked under their feet and would not pollute people of the upper caste by falling on them. Samboli!, by extension, could imply ‘Beware! in the present context of dalit uprisings. It could also be a clarion call for Dalits to fight for their humanity. I was born on 3 May 1957 in Kathriguppe village, south Bangalore. My father Muthappa and mother Venkatamma were daily-wage labourers. I walked to the Government Primary School in the village and the Government Boys Middle School, Basavanagudi before moveing to Sri Narasimharaja Hostel, Chamrajapet to do my high school at Old fort high school, Chamarajapet. From 1980, I have been second-division clerk at Sree Veerendra Patil Pre-University College of Arts, Science and Commerce run by the Hyderabad Karnataka Education Society. In 1985, I founded Pragathi Education Society that run the Pragathi Degree College for Dalit students. 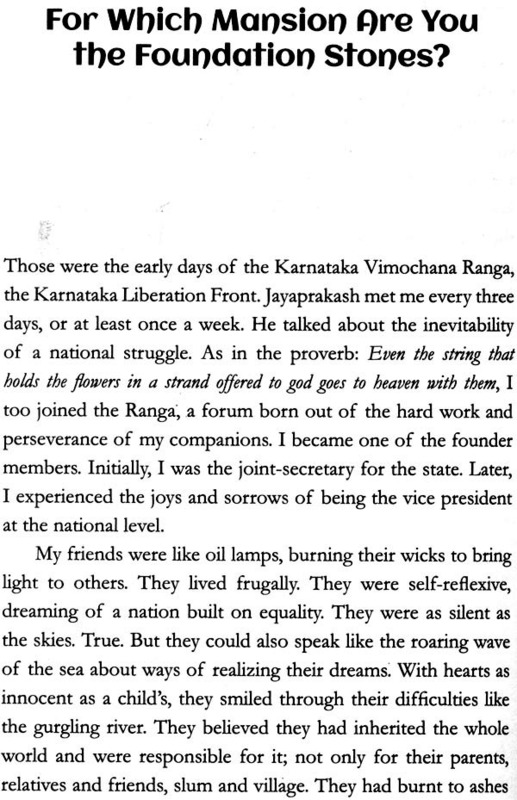 From 1992, I was on the founder member of the Karnataka Vimochana Ranga with other social activists and served as joint-Secreyary until 2000. Since then, I have been the founder member of jaathi vinaasha Vedike that fight for our constituonal right to equality at the national level. Our activities have to be social only; never political. I took forward to a casteless society. I desire that my writings will be a refrain to the voiceless dirge of my people. I hold my struggle and my writing as the very breath of my being through which I fight with the hope that society inequalities may cease; that equality may reign. It is my one desire that we talk to one another with open minds and laugh with one another with open hearts. 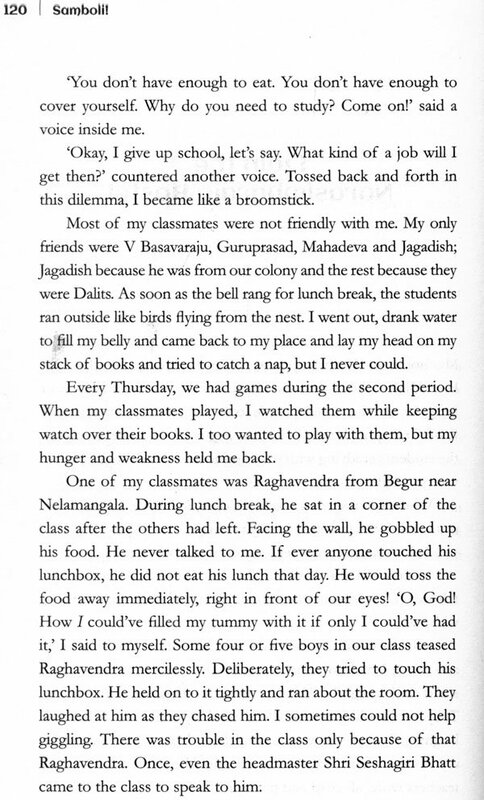 I cannot express my happiness with Susheelamma Punitha called me one day and said, ‘I would like to translate your athma-kathe into English.’ To translate a piece of writing dealing with sensitive issue is indeed a difficult task. Not just that; it is not easy to grasp, still less translate, the local variety of Kannada used by our Madiga community. I remember the time I stretched out my arms while telling her that the cane used to punish us in school was long as a baaru and she said she knew that unit of length as a maaru; flower-vendors stretched out their arms similarly to measure strands of jasmine. I know she has painstakingly understood and transcreated the language of abuse, protests, fights, food habit and cultural practices in Samboli! She asked if she could add an exclamation point to the little. It is an excellent idea. Samboli! conveys our excitement in what we have accomplished and our hope in what we wish to achieve. Samboli! has gained a meaning it did not have when my ancestors used it. My boundless thanks to Susheelamma Punitha. My greatful thanks to Shrimathi Mini Krishnan too. Her help amd encouragement have been a unique experience for me. 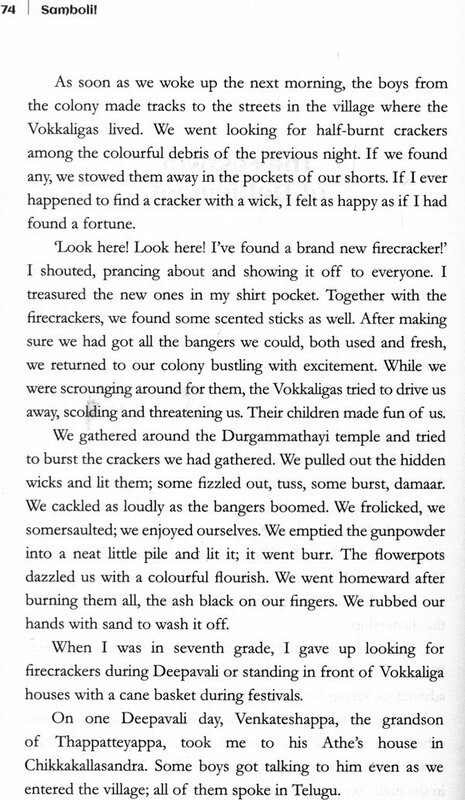 As per her suggestion, I have added an afterword to my athma-kathana. by David C. Buck and Kannan M.